Ideal Credit Union recently celebrated the groundbreaking of its newest location in Stillwater with a “ceremonial groundbreaking” held onsite on June 22, 2016 and attended by local dignitaries and community leaders, members of the credit union, members of Ideal’s board of directors and representatives from Ideal. This location makes Ideal the first credit union to open a branch in Stillwater. Ideal CU held a ceremonial groundbreaking at the site of its new Stillwater branch at 2020 Washington Avenue on June 22, 2016. We are excited to become Stillwater’s first credit union and offer a more contemporary approach to traditional banking. - Ideal CU President/CEO Brian Sherrick. 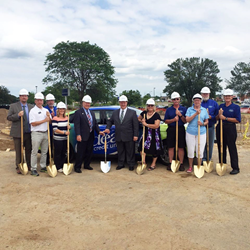 Ideal Credit Union recently celebrated the groundbreaking of its newest location in Stillwater with a “ceremonial groundbreaking” held onsite on June 22, 2016 and attended by local dignitaries and community leaders, members of the credit union, members of Ideal’s board of directors and representatives from Ideal. This location makes Ideal the first credit union to open a branch in Stillwater. The new office is scheduled to open in late fall or early winter of 2016. Ideal Credit Union will build the new branch in Stillwater this summer, becoming the first credit union to operate in the community. The new Stillwater office is being designed by Collaborative Design Group, Inc. and constructed by James Steele & Company. The branch will be located at 2020 Washington Avenue, the design of the new-construction, 3,000 square-foot branch is similar to the location recently opened in Inver Grove Heights and features free Wi-Fi and a self-service coin counting machine. Two 24/7 drive-up ATMs are also available. Hours will Monday through Friday 9 a.m. to 5:30 p.m. and Saturday 9 a.m. to 12 p.m. Mortgage Services and Wealth Advisor Investment services will be available in branch on an as-requested basis. In attendance at the ceremonial groundbreaking were members of the Ideal Credit Union senior leadership team and board members joined by the Greater Stillwater Chamber of Commerce Executive Director Robin Anthony, MnCUN Vice President of MnIPC Dean Scholl, MnCUN Director of Communications Andrea Molnau, James Steele & Company Senior Field Superintendent Mike Sonnek, Collaborative Design Group Incorporated AIA, Principal Bill Hickey and Associate AIA, Project Manager Elizabeth “Bess” McCollough. Founded in 1926, Ideal Credit Union is a member owned financial institution that specializes in providing excellent member service, great rates and convenience. Ideal CU offers a complete range of services, including a full suite of electronic banking products, savings, checking, loans, mortgage products and title services, exclusive VIP member payback, business services, investment services and more. Ideal Credit Union is conveniently located in Inver Grove Heights, Hugo, North St. Paul, Eagan, Woodbury and there is a Student Branch at Tartan High School in Oakdale. Visit http://www.idealcu.com for details and locations.